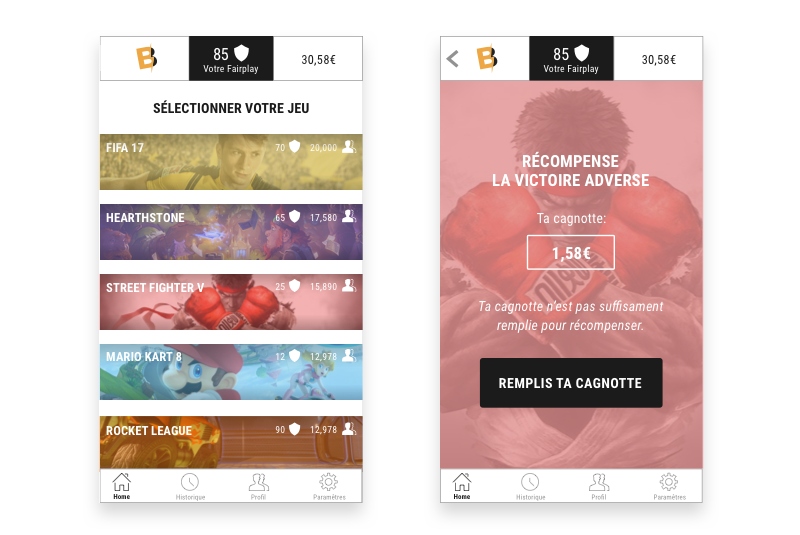 BeatMe is an app that helps gamers to find opponents and compete for a small price. The goal is to create a strong e-sports community based on fair-play and sportsmanship. I was approached by the team, as a freelancer, in late 2016 to work with them on the company branding and the first design for the global launch of the app. Based on the work of an UX Designer and the features backlog of the development team, I worked on the first draft of navigations and interactions. With no Product Designer, I had to encourage the team to build a design workflow, setting up some tools and help them understand the best spot for a designer in their squad. When all the workflow was theorised, I began the work on the new branding. I tried to keep the DNA of the legacy logo as much as possible. After few months of work, and several back and forth, I delivered a complete design of the app. We choose to organise the UI around the pictures of the games that we use to create a considerable emphasis for the users. After the complete validation of the App by the stakeholders, I followed the production of the app on iOS and Android. Even with my background in web development, I never had the opportunity to learn how to create a native app. It was absolutely great to work closely to the team, learning what are the constraints on all the mobiles devices. The launch was a success, and the users loved the designs and were very vocal about on social media. After few days of bugfix, all the features that we wanted to implement in the V1 were live and running. Even after a year the product is still going well, and the team began growing bigger and bigger.